Tamil Nadu's worst and most relentless rainstorm in a 100 years is showing no signs of letting up. Life in capital Chennai ground to a complete halt as a fresh wave of rain lashed the city where 15 teams of the National Disaster Response Force have arrived. Industry lobbies are putting a Rs.15,000 crore figure on the expected financial loss as weather forecasting agencies predict heavy rain to continue for at least the next two days. The unprecedented rains, the worst in 100 years, have battered Tamil Nadu's northern districts such as Chennai, Tiruvallur, Kanchipuram and Cuddalore, the toll has crossed 190 and is being covered extesively by media, both in India and internationally. We'd like to urge all our family and friends to support us in raising Rs. 1 lacs, that will be deployed for helping the victims of the floods who have not only lost millions worth of valuables but also their only homes. 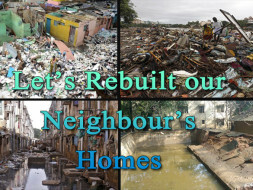 Funds generated will be used to repair the houses in Valasaravakkam area. By this fund we will primarily repair the houses which were affected by this flood. If the houses are completely destroyed then we will construct Transitional Home(1 HOME 2 FAMILY Sharing basis) untill any other goverment aid reach or victims repair their houses at their own effort. 1 transitional home will cost approximate RS. 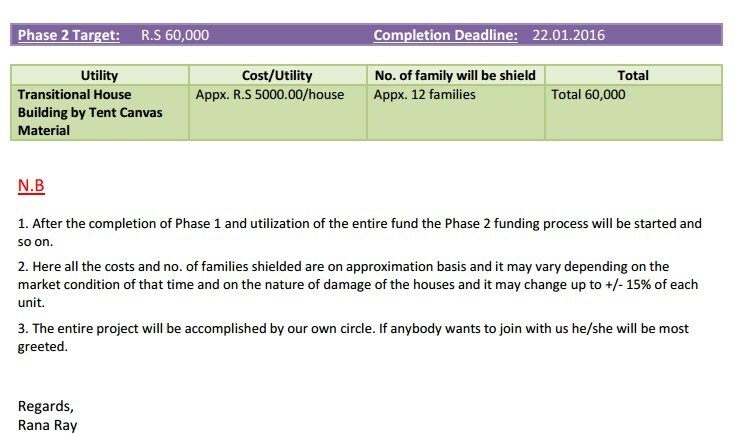 3,000 and repairing for 1 house would cost upto Rs. 10,000.00. So, we are requesting you kindly stand by our side and help the victims by your small contribution.